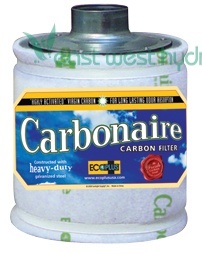 These filters offer an economical and extremely effective way to remove unwanted organic and chemical odors. Carbonaire uses highly activated virgin carbon to assure maximum odor filtration. These filters are easy to use and under typical conditions will last at least a year. Each unit includes a pre-filter that collects dust and other airborne particles from clogging the carbon. Highly activated virgin carbon, for long lasting odor absorption. Pre-filter that collects dust and other airborne particles. INdividually boxed and wrapped to keep the carbon fresh. Constructed with heavy-duty galvanized steel. 4" and 6" sizes only can be sent via UPS. Dimensions: 13.25in. × 13.25in. × 8.5in.